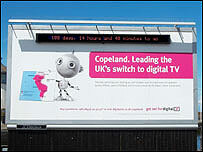 Digital television is now installed in 84% of UK homes, according to the latest research. It marks a 13% increase since 2006 - the biggest year-on-year increase yet. The figures were released by media watchdog Ofcom in the run-up to digital switchover, which begins in Whitehaven, Cumbria, in October. Chief executive Ed Richards said the figures were "extremely encouraging" with less than a month before Whitehaven's analogue switch-off. In the second quarter of this year (April to June), nearly two million Freeview boxes were sold. Digital terrestrial is now the most commonly used platform on main TV sets, available in more than 9.1 million homes. Satellite - both pay monthly and free-to-view - follows closely behind, with a presence in 9 million homes. Sky now has nearly 8.1 million subscribers, with 77,000 new customers in the second quarter of 2007. The total number of homes with cable television also continued to rise, with more than 3.4 million subscribers at the end of June. There are about 35 million secondary sets in the UK i.e. outside the main living room. More than 10 million of these have also been converted to digital. Analogue TV is expected to be redundant across the UK by 2012.